8/8/18, Review by jaydee - Been a while since I have played here. I've been missing some great golf. Fairways and most all greens in excellent condition for summer. A couple of fun holes. A challenging but fair course. Will be back soon. 6/8/18, Review by KyleSmith - Got out of the office a little early and played a late 18 with B-Man himself. I had never played this course and have heard so many good things about it, so I was excited to get out. It didnt disappoint. The fairways were green and in great shape, and the greens were fast and true. There was a little bit of an issue on 17 green (not sure if its winter kill or what), but it seemed close to flawless other than that. Can't wait to get back to this course. 4/19/18, Review by aepfeiffer - Greens are in excellent shape, cant ask for much better conditions, still quite a few dormant spots on the course, but fairways trying to grow out slowly!!! Overall still one of the best courses in the region! 3/16/18, Review by GolfNiners5 - Excellent condition. I honestly have nothing to complain about. 10/14/17, Review by Opow - All I can says is that this place is in great shape as it always seems to be. The price is a little more than I like to spend but it was worth it. Greens are always fast and true. I still don't like the bunker because of stones in some of them but other then that I would always recommend playing here. 10/2/17, Review by hotrod jb - Course is in great shape! Greens roll really quick and true. Only reason for not giving 5 stars is the price. 7/2/17, Review by The B-Man - Tee to green the course was in good shape. The bermuda greens were immaculate and rolling well but not super slick. The carts have pretty accurate GPS touchscreens and they were helpful. While I generally like the layout and enjoy the challenge of this course, the wooded areas that frame each hole have now overgrown to the point where they are virtually unplayable if hit an errant shot. While I realize that you're not supposed to hit it there, I'm just pointing out that the course is not as forgiving as it once was in that respect and it can make the round very frustrating if you hit some loose shots. Because of that, I'd characterize this course as target golf, with fairway accuracy a must to score at all. My other beef with the course on this 90 degree Sunday was that there was no cart girl at all. When my partner purchased 2 beers to start the round we were told that all the coolers were out on the course and were not given any ice - so we didn't have a cold drink after that first beer on the front nine. I struggled to make it to the 8th tee where they had a water bucket. Overall, the course is worth playing with those caveats. 6/16/17, Review by GolfNiners5 - I continuously looked for something to give them a 4.5 instead of 5 but came up with nothing. Course is in immaculate condition. Greens are excellent and roll true. Fairways, bunkers, tee boxes all in great shape as well. I haven't played here in a couple years but they also added a new GPS system to their carts that is easy to use and very helpful. I would recommend this course to everyone. Pace of play was slow but mainly because we were a 2 some playing behind a 3 some (2 older ladies and a gentleman), we caught up to them on number 8 and played the first 9 in 1:40 and the second 9 in about 2:20. If they would have let us through we would have gotten around in about 3 hours. Go play if you have the chance!!! 5/8/16, Review by GetThere214 - Course is in great shape. Was a great day. Fairways were fantastic and had no reminisce from the winter rot last year. What a great surprise having the new GPS in the carts. 1/3/16, Review by nstoudt - Course was in fairly good shape considering the time of year and the recent weather. There were some areas that were very wet however. Greens were in great shape though. My only complaint was with the starter who wouldn't let us out before our tee time. Meanwhile no one was waiting, nor had teed off in the previous 20 minutes. The fairways that were sprigged with new grass have now been mowed and are OPEN for play. All holes are back to their regular length, except 2 and 6 which being played from the forward tees. The greens are in GREAT shape and rolling a consistent 10 on the stimpmeter. Thanks for everyone's patience as we have restored Rocky River to the condition you have come to expect. 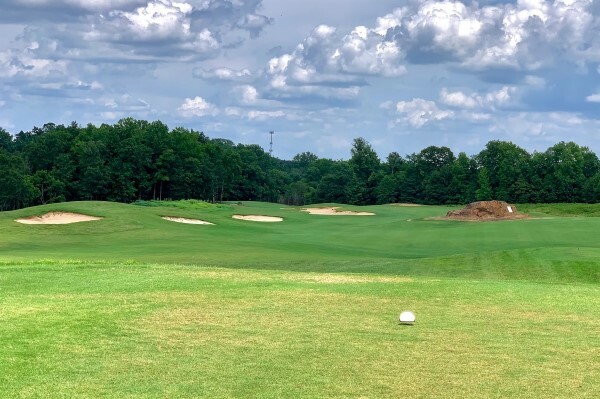 Like many courses in North Carolina this past winter, Rocky River Golf Club unfortunately experienced some winter kill of Bermuda grass in fairways and teeing areas. Some courses in Greensboro and Raleigh have had to close completely due to the damage incurred, but in Concord the impact was not quite as bad. Rocky River has re-sprigged fairway areas on 8 holes and expects to have all areas completely back by Mid-August. The course REMAINS OPEN though, with several holes on the front 9 shortened to route play around the newly repaired areas. The 9 has been reduced to a Par of 31, and is playing much shorter which has been very popular! for juniors and senior players! We are offering reduced rates for the entire month of July to compensate for the repaired areas. We apologize for the temporary situation but look forward to when it's back to 100% later this summer and fall. Thank you for your patience and continued support of the club! 5/9/15, Review by slowmofo - This is the worst I have seen Rocky River in a long time. The greens are great as always, but for some reason a few fairways and tee boxes have not come back. If you play Greens expect to be by the tips. If you play whites, some holes might have you playing off the ladies tee. They are having the PGA qualifier this week which i know has the groundscrew probably stressing. The grass is bermuda though so I expect it be back in shape in the next couple of weeks. 7/12/14, Review by The B-Man - Played in a FindaGolfer event with about 3 groups. It was a fun round, just a little frustrating for me on the greens. They had been punched about 3 weeks and you could hardly tell, yet they were bumpy. I burned and lipped about 6 or 7 edges of the cup all day. It was difficult for me to make a putt, but it was more me than the course I think. I still need to get used to the bermuda greens around town since so many courses have them now. I had the same trouble at Red Bridge for awhile. Outside of that, the course was in fine shape -- no issues with tees, fairways or bunkers that I noticed. The course did a great job of hosting us and I had a chance to meet Ryan Brickley, the PGA Director of Golf here. I nearly aced the 10th hole (see Instagram or Twitter for the pic) and our whole group had a good time. Be sure to check out their website which has a lot of great information about the course and amenities along with photos and a hole-by-hole tour. 6/23/14, Review by DrSchteeve - Perfect, except just punched, so it will be a few weeks for the greens to catch up to the otherwise superb course conditions. 6/16/14, Review by tvrepairex - Course is in great shape .Tees good,fairways green and full.Traps raked but the sand is a little course.Greens smooth, firm, and fast.Only "complaint" was some of the pin placements must have been U.S. Open related...On slopes and ridges .Made for some tough putting. 5/14/14, Review by DrSchteeve - Greens great, fairways good, teeboxes and traps not so great. 4/24/14, Review by syncgolf - Best Course in town for the money. The grass is finally alive and you could drive in the fairways and the ball had grass under it. I love the layout,the greens are very smooth and sneaky fast. Had a beer on the deck after the round. Great day of golf! 11/3/13, Review by DrSchteeve - Other than traps not raked, perfect. Pace of play 3:45 on a Sunday. Beautiful full year grasses make it visually appealing even in the fall and winter. Highly recommend. 10/3/13, Review by aimtobreak80 - The course was in good condition - tee bases, fairways, greens, and bunkers - all fine. The price was very good - $30 for a senior, Concord resident - hard to beat. The course management, and especially the marshal - a little irritating. The foursome (a twosome and two singles) was thrown together to fill the tee time. That's not entirely unusual, but it is the first time in my nearly 60 years of playing that I shared a cart with a total stranger, and I was not entirely comfortable riding with someone whose driving skills and comportment were completely unknown to me. Apparently, management was limiting carts because of a tournament scheduled for just after noon. The tournament was also the reason for the marshal to repeatedly ask us to speed up play even though we were NOT being pushed by players following behind us. I believe that the constant badgering by the marshal led to exactly the opposite of the desired result, causing mishits by all in our foursome, and leading to slower play, not faster. Two members of the foursome were particularly upset by the constant, and repeated, visitations by the marshal. Finally, one of the members of the foursome, who had never played the course before, was somewhat critical of the number of forced carries over marshy areas, especially off the tees. I would add that the fact that the reeds and marsh grass immediately adjacent to the tee bases had not been cut, and it increased the difficulty significantly, demanding an elevated, arcing trajectory to clear them but sacrificing some distance/carry in the process. Still, not a bad round, but I wish we had been advised of the tournament, and its potential impact upon play, when calling for a tee time such that we might have considered playing elsewhere. 10/1/13, Review by syncgolf - Best course condition public course in town and on the B list!! The course was in perfect shape from tee to green and every where in between! The greens are Mini Verde they rolled very true and fast (probably a 9 on Stimp) The green complexes are very large but fair! It''s a sweet Dan Maples design I think! I especially love the back nine which is nestled down in a swamp area! The back nine has great elevation changes and requires a wide variety of club selection into and around the greens. 9/29/13, Review by DrSchteeve - Greens are starting to hold shots, perfect rolling and very quick. 9/5/13, Review by SmitteyB - Got a fantastic rate on GolfNow for $19 - a fantastic value. It wasn't too busy and I got out as a single. The greens are still firm but are the nicest in Charlotte as far as I'm concerned. They are full, smooth, and fast. This was the highlight of the round for me. Tee boxes were very very hard. It was difficult to get the tee in the tee box on a couple of holes. Fairways were mowed and in great shape. Bunkers were raked with sand up on all the edges. I scooted around the golf course in 3 hours which made me very happy. I will be going back before the end of the season. This place was just great! 6/29/13, Review by aimtobreak80 - The good news is that I broke 80. The bad news is that it was for 14 holes. The "slow moving" thunderstorms of last night really did a number on the course, and a significant number of greens and fairways were closed/under water. The staff did a great job of salvaging the day by picking 7 holes that were playable and playing them twice (Holes 1,2,3,6,7,8, and 9). Holes 6 and 9 were using the Red tees, so one had a very good chance of driving the green on No. 6 I want to emphasize that I consider the round and course conditions to have been excellent considering the weather of the previous night. If anyone is uncomfortable with the above described arrangements, I would recommend, and encourage, you to wait a week before trying to play the course - give it a chance for the water to recede, and the fairways to recover. 5/26/13, Review by SmitteyB - Rocky River is really in great shape now as compared to my last review. I got a great rate on GolfNow, for $42. I was concerned about being over there on raceday since we were going ot the race, but, it was extremely quiet and convenient. The greens are in fantastic shape. I know there are complaints about the greens being too firm and being unable to hold the ball, but with controlled trajectory the course is certainly playable. It was reminiscent of 2006 US Open at Winged Foot when those guys couldn't hold greens. It was VERY challenging, but VERY FUN if you are a golf fan and want to see what other surfaces offer. The tee box on number 1 has been re-sodded. It is very ugly, but should take root soon and it will be fine. Course is still wet in areas and roll-out isn't a sure thing, but the ball wasn't plugging by any means. I think these new greens are leaps and bounds better than the other offerings in the area. They roll true, smooth and fast. Ranger said they will be verti-cutting them in the upcoming week. A great value for $42! 5/21/13, Review by IM4DHERD - Always liked Rocky River from a layout perspective and the rates are fine. I am playing in a Tues PM nine-hole league over there and although the fairways are in really good shape, something went wrong with their upgrading of the greens. No one can get a ball to hold on them and the place just isn't designed for hitting short and rolling up with many greens just elevated enough that the ball stops in front. Verdict Ridge and others changed to the Verde strain and don't have this issue. Even after heavy rain, it's like trying to stop a ball on a pool table. Takes the fun out of an otherwise really nice course. 5/5/13, Review by SmitteyB - First time playing Rocky River since 2004 so I don't remember much to compare it to. So this will be a pretty unbiased review. The new greens are beautiful. Most of them are full, a few show what look to be old punch marks, but are what I have decided are just small bare spots. It does not affect the rolling of the ball on the putting surface, it's just a nit-picky thing. A few larger bare spots on high points on the outside of a few greens. Again they are a year old and will mature. Fairways have a few dormant spots from the cooler weather. When we tee'd off it was 49* and about 15-20mph breezes, so obviously Bermuda isn't going to thrive. Tee boxes were okay and the bunkers seemed to be in good condition. It was worth nowhere near $65/round, but a fun Saturday. 4/22/13, Review by outliar - I am reluctant to rave about the course cause I want to keep it a secret. Damn!!! Greens are coming in beautiful. Still rock hard cause they are new, but they may be the best in Charlotte BAR NONE! Johnny Harris WISHES Quail had these! Rest of course is well maintained and I cannot wait to see what this course is like mid summer once it has greened up. Only reason not 4 stars is that cool weather seems to have delayed green-up. 4/17/13, Review by Eric - Course was in great shape with green grass in the fairways. The new Bermuda greens do putt great but are still way too hard. They almost act like a trampoline to approach shots, even ones hit high with short irons would not hold the greens. Really wish they could something to soften them up. 4/10/13, Review by atw4377 - Played Rocky River on 4/10/13. The bermuda was beginning to green up with the 80 degree weather but most of the grass is still dormant. The fairways gave you some tight lies but that goes with the time of the year. The greens (re-done about a year ago) are still very hard. The grass is growing well and there are very few bare spots. However, the firmness makes approach shots very difficult and a times unfair. I got a online rate for $17, which is a steal for this course. I'd be hard pressed to pay the full rate though. On a side note, the starter (or master of the tee) really loves giving instructions. 4/7/13, Review by Cant3Putt - The new greens are doing well healthwise but they are very hard and barely make a ball mark when hit. My playing partner hit five greens near the flag and every one of those shots rolled off the back. Play every shot into the green to roll out 10-15 feet. The pins were pretty close to the green edges so that didn't help either. I reccommend playing to the center and take your chances with the 40 footer. The bunkers were in great shape and had plenty of sand so playing into certain bunkers greenside might be a better option than trying to land a 5 or 6 iron near the hole. Fairways were still dormant and had quite a few sand divots but really didn't affect play negatively. The tee boxes were sand on most holes. I'd say the courses in this area need to stick with Winter rates until the Bermuda fairways are growing again. Rocky River will NOT have any Spring aerification because of the new greens. They only need 1 per year, and that will happen in July. Course is is great shape! 3/29/13, Review by metallikviper - This was my first time playing this course. About everything was perfect tee to green. The greens have softened up well after they were changed last year. Only reason I gave it 4* was because we had not wait for atleast 40 mins to tee off and we had a 8:30 tee time. I would golf there more often if it wasn't such a long drive and it can get pricey on weekends. 3/13/13, Review by JHG - Course is in good shape. Tees, fairways, greens all good. Cart path only but what course isn't with all the rain lately? Service is excellent. Enjoyed the course and look forward to playing RR again soon. 3/7/13, Review by TheClaw - First time I have ever played this course and I thoroughly enjoyed it. Fun, friendly layout, and the back 9 is quite scenic. The greens are hard, but the only time that really caused an issue was on #17 which is exceptionally hard. The rest of them were still pretty receptive to pro Vs coming in high. They were a little bumpy due to a recent aeration but I think they will be brilliant come spring/summer. The guy in the pro shop, Ryan I think, was very friendly and gave me a free yardage book when I told him it was first time playing RR. All round great experience. Wish it was closer to Charlotte but will be back. 3/2/13, Review by tvrepairex - Course good shape considering very rainy conditions the last two weeks,but it was cart path only.A little bit wet and muddy in places but ok.The greens were smooth,fast and hard ,even after the rains.My score was quite a bit higher than it should have been due to the hardness of the greens.Could not stop any shots.I have never "hit" so many greens in regulation and be chipping from behind the greens in my life.If you tapped the green with a club,it sounded like hitting concrete.It reminded me and my playing partners of a billard table both from the carpet like surface,the hardness and the speed. The good part was $20 for 18 holes at Golfnow.The staff was friendly and helpful. 2/5/13, Review by aimtobreak80 - Continuing to explore the courses north-northeast of Charlotte. The morning was overcast and in the 40's with a moderate breeze contributing to wind chill. The Senior rate greens fee was definitely a bargain for this course, on this day. Being new, I purchased the yardage book ($5)which may be a little pricey considering the amount of advertising that is included. However, I would definitely recommend it to anyone unfamiliar with the course. The greens were like a carpet with only poorly recovering ball marks marring the surface. I don't believe that the latter had any effect on putting - just like Bman's assessment, they rolled sure and true. The fairways were all brown, but in very good condition. Only a few tee boxes exhibited obvious wear and tear. The afternoon weather improved to sunny and near 60 degrees, and I believe that improved my play on the back nine (3 over for a 39). I will definitely play this course again, and I wholeheartedly recommend it. 11/21/12, Review by pegasus20 - Rocky River is in great shape and a very fun lay out to play. Greens looked and rolled perfect. They're receptive to solidly hit iron shots and missed shots that land on the green will run out which is how it should be in my opinion. Although I only hit out of one bunker, all seemed to be nicely raked and full of sand. The course was nice and clean with leafs blown back into the woods. Also staff was very friendly and welcoming. Rocky River is a must play and I can't wait to get back out there. 11/16/12, Review by DrSchteeve - Perfect says it all. Greens have softened so are now holding good shots, and perfect is an understatement for how good they are. Bunkers raked with consistent sand. Rough medium and fair. Fairways firm and fast. Rocky River is especially nice in the fall, winter, and early spring, as the landscaping has a lot of tall grasses that remain beautiful and frame the holes nicely even when the leaves have left the trees. And because trees are not so predominate, there aren't as many leaves to hide balls or make putting difficult. 10/26/12, Review by IM4DHERD - Played Friday for a $30 GolfNow fee. Excellent conditions. Fairways and Tee boxes in fantastic shape. Greens are very, very firm. Need to hit up and roll, vs. shooting for the pin. Had my worst 9 holes in 3 years, but not due to the conditions by any means. Another thing - seems not many are aware that they are re-opened. We didn't see much of anyone (2PM tee time) until the final two holes. 8/27/12, Review by izzyf150 - Reconfirming what the last person said. Yes the greens are very hard. Everything is is good shape. I am going to knock 1 star off for the hard greens. One last thing $49 to play on a weekday. Yeah the course looks great but the price will make it a once in a blue moon for me instead of being in the rotation. 8/24/12, Review by DrSchteeve - First, general course conditions near perfect - fairways great, traps fair, rough deep but fair, tee boxes great. Now, the new greens. Very consistent, very true, just a very small number of places where they haven't completely grown in, and pin positions usually made those a non-issue. But...be warned...these greens are very, very firm. Even if you hit the ball very high, it is difficult to stop the ball. I've been told that new greens in general are usually very firm for as much as 1-2 years after they are put in, so unless they cut them higher it may be a while before they start to hold. Don't get me wrong, they are very fair, but difficult - you really have to play strategic shots into the greens to try to get the ball close to the hole. 8/19/12, Review by YoMama111 - So, Rocky River just reopened this Saturday. I figured let's go try it out. Best greens I have putted on all season. They are PERFECT!!!!! The fairways are great (seems like they are cartpath only most of the time) the rough is thick and penalizing. It is great what they have done with the course during the redo. 8/19/12, Review by slowmofo - Wow! So I used to live by this course and was always told about the atrocious greens. Well that is now solved. I got a good deal and could have played even cheaper on Sunday. The course has an awesome semi-challenging layout. A couple fairways were tight, so it was good to pull something other than driver even though you wanted to. As the other review stated the rough could really mess your hole up. The greens were awesome. Though number 18 still looked to be a work in progress, and couple holes did have some sand repair on them, they played true. The greens also weren't that fast as they are trying to beef them up over the next couple of months which is understandable. There are really only two drawbacks to this course. One, a couple sandtraps were a tiny bit rocky. The other drawback was that mud bogging was going on next to a few fairways that was loud as all hell. Overall for the price point I paid, I would be back everytime. Seriously, if it was between this at this price point and verdict ridge at $65, i would take rocky ridge. Check out the Charlotte Observer post below. Rocky River opens on the 20th with special rates and Verdict Ridge follows on the 25th. Good stuff. Rocky River has started green replacement with Bermuda; they will have 9 holes available for about 10 days, then temporary greens only until reopening approximately August 15. Verdict Ridge will start replacement June 25, limited temporary greens then available until reopening approximately September 1. 3/19/12, Review by Hereitis - I like the layout of this course and a good majority of the holes but after that it's all downhill. Hopefully when they get new greens this place will be better because now these greens are atrocious. They had 3 different type of grass growing on them I think one of them was weeds and they were rock hard nothing will stick on them. Such a shame, stay away from this course til around September when the new greens will hopefully be done. 9/17/11, Review by Jova007200 - Went back to RR today. I must say, they are taking action on the greens and they aren't as bad as they were several weeks ago when I played last. I didn't see any burrows today and there were fewer spots of crab grass. I was able to 2 putt, and in a few cases, 1 putt some of the holes so it is better. There still are several that have bare spots, but they didn't come into play for me. Fairways were well kept and the sand was excellent. Tee boxes were good. I broke 110 for the first time in ages. I know that isn't that great, but for someone who never took it seriously before and just started back up it isn't bad. Its largely because of the horrible start that I had. I could have shaved 12 strokes off by hitting the range before my round to get the kinks out, and by improving on putting. 9/4/11, Review by ThatDudeP - Now I'm a little partial to Rocky River. I like the design, the obstacles and the marsh on the back 9. Lots of doglegs, and fairways are almost always flawless. Very little divots and neatly trimmed grass. The only downfall here though are the greens. Almost all of the greens are rough, with crabgrass and patches. They aren't the worst I've seen, but in contrast to the fairways, they're a sight for sore eyes. Still a great course, challenging and fun to play. When there's a race though, it willllll be loud. 8/21/11, Review by BallStriker - Don't do it! I say this because the greens are in terrible condition. The fringes are nonexistent and the greens are bare at best and there are actually weed patches on them. The shame of it is the fairways are nearly perfect. I would avoid until the greens improve unless you want automatic 2 putt all day long. 8/7/11, Review by Jova007200 - The course itself was wet still in places from the recent rain. However, the heat of the day dried most of that off. The fairways were just fine. One or two bare spots here and there, but its been a while since we've gotten decent rain and its been hot. That wasn't a big deal to me, as it isn't going to realistically affect your game. The traps were hard and some of them had spots of erosion due to the very recent rain. They may have neglected them due to the coming rain for today. The problems lie in the greens. A few have bare spots, but they are small. Most, if not all of them have weeds growing through them. They're obviously mowed down, but they will affect ball speed and direction; some of them substantially. There were a few greens with Red Velvet Ant burrows, the 16th was bad at the front edge, but that really isn't the fault of the course... They can't stop them from burrowing. However, the weeds are unfortunate. I would have loved to rate the course well based on the rest of the course, but the greens are just..... unfortunate. Twilight is recommended for golfers who want to hunt for balls when its empty behind them. A lot of balls in the deep stuff, in the weeds, and in the wooded areas. Just be careful that you aren't picking up a ball that someone else like me just flew in, hehe. 7/22/11, Review by BetterThanMost - Rocky River was in great shape. Fairways were the best I've seen there in quite sometime. Greens also were very good, even the reworked 16th. The greens were being syringed at various intervals during my round. Bunkers were the only real disappointing part of the course. Many looked as if they hadn't been touched in a few days. Pace was great as there weren't many groups out on this hot day. Played thru a foursome on 6, and then again on 11. 7/1/11, Review by El Supremo - Course is in great shape. Tees, fairways,bunkers, greens are all in great shape. Rough is very thick and will cost you some shots. Lost a couple balls in the 2nd cut. Not much else to say. Go play it. Fix your ball marks. 6/4/11, Review by Ironcitybrewery - I love this course. I like the setup and the scenery. The fairways were in good shape, but we weren't allowed to drive on a good bit of them, which was somewhat annoying. ( I don't mind actually doing some walking at a course) The greens also were in good shape. The staff was AWESOME! There was a mistake in a online booking I made(by the company) and he honored the price. He definitely didn't have to do that with it being a Saturday. If you haven't been here, I would highly recommend it. 2/18/11, Review by DrSchteeve - Several greens with some bumpy spots, otherwise pretty normal conditions for this time of year. I really like the layout. Ri Ra Irish Pub would like to welcome all interested parties in joining us for our 3rd annual Charity Golf Classic: Wednesday, August 25th 2010 10 AM Shotgun, 9 AM registration, Rocky River GC. All proceeds will benefit the NC Fire Fighters Burned Childrens Fund. Cost is $100 Per/$400 foursome. There will be breakfast, lunch and beverages (including beer) provided along with lots of prizes, raffle items and giveaways. One lucky foursome will win a golf trip to play in Ireland! To register please go to www.rira.com and follow the links to the registration page. CHEERS! Rocky River's greens have vastly improved over the past year there was a stretch for about 2 years when they were very bad. Of late they have gotten better, they are not perfect but are definately getting better. I am going to play Rocky River for fathers day and was wondering if the greens are good. I have heard mixed reviews on them. Has anyone played it lately? Thanks and Happy fathers day to all the great dad's and as my dad used to say "TAKE It easy but Take it." 4/16/10, Review by jnivo - Course was a little bit rough as the fairways have not filled in yet. Also the poana is significant on most of the greens. The par 3 5th hole is completely covered. The only other issue was the Marshal was quick to snap off on my playing partners who accidentally drove across the green inside the no cart sign that was about 150 yards away from the green. All said it is just an average course that doesn't give you a lot of reasons to want to play there except for once a year or less. The best part of the club is the clubhouse grill. It is well stocked with frosty mugs and great yengling draft. I guess when you are owned by a hotel you would have to get the bar and grill right. 4/9/10, Review by t2green2 - Fairways were green but hard. Rough is growing in nicely but the Greens were terribly slow. Poa annua has taken over a large majority of the greens. The course itself is a great layout and I am hopeful they will regain their greens. Played here a few weeks ago. Overall, the course was in good condition. The fairways were nice and green, plenty to hit off of. Some of the greens were a little suspect of the trouble they are having out there with the re-sodding and the loss of some of the greens around the edges. Some un-fixed ball marks were not helping much either, but that is due to the laziness of some "golfers". Hopefully, with a lot of hard work and care, they can get the greens back to the caliber they were a few years back. Not really a $49.00 course for a 1:00 Sunday tee time. This course is a good $35-39 rate, not $50.00. Will definately go back, but it will be awhile. I play Rocky River every couple weeks and the last time was 8/25... it was in good shape with the exception of a few greens having some problems. Usually the greens at RR roll as good as pretty much anything in the area, except maybe the Warrior. Other courses I have played this time of year have also had problems with greens as well, so I'm really not that surprised. Hopefully they will start growing back in before fall and should start rolling well again well before the end of the year. I spoke to the director of golf and PGA pro out at Rocky River. He acknowledged that they have 3 problem greens right now (#4, #10 and #16) with bad spots and will be re-sodding them soon. He expects they will be back in shape by mid-September. The problems started with flooding last year that required re-sodding and the new sod contained nematode worms that damaged the roots. I'm interested to read other opinions on the current state of the course. The pro felt that the other 15 greens were very good and rolling well and he said they've kept the pins on the other 3 holes away from the bad spots. So it should still play fine. I haven't been out to Rocky River in a while but I enjoy the layout and would like to get out there again. Let me know if you've played recently. Played Rocky River this morning (8/23) for the first time. The layout is pretty interesting and there are some great holes. However, the greens are really struggling. Many areas of dead grass and a few holes even have large (5x5 roughly) areas of dirt/mud. Probably a great course ... just not right now. i've played this course twice in 2 years and always hear great layout bad greens. i think that when the hotel/conference center bought the course that's when it went really downhill. too expensive for what you get. I'll have to get back out there some time. I probably haven't played Rocky River in six or seven years. Great layout, but I got so sick of the crazy pin positions I started playing elsewhere. It's a shame to have such big greens and not want to use them. Rocky River Golf Club Lee F.
Headed out to Rocky River Golf Club for the first time today. Wasn't extremely impressed with the course. Looks like it has some wear and tear, which is completely understandable for it being August right now. The greens were consistent but had a lot of ball marks. The tee boxes were in bad condition. Fairways were fine and the rough was very thick. I hate being in the rough to begin with, and this course's rough made it that much harder. I would say this is a "good" course. Not great, but not bad. Definitely a course to check out. It's right next to Lowe's Motor Speedway. Played Rocky River last Saturday. I thought it was in really good shape T-boxes needed work but fairways were really nice and the greens were very puttable.Price was great for the weekend with the coupon offered on there website. I say go for it! I have not played Rocky River in years. Good course overall, but try to avoid playing on weekends. Normally on weekends they used to put the pins in impossible locations at the edges, and the greens are big. You could hit the center of the green and still have 50 feet for birdie. Don't know if they still do this, but call ahead and ask sarcastically if they have the pins actually on the greens. Seriously though, it's a solid course, but find out the pin positions before you go. We just played there last week. Course was in good shape and fairways were just starting to green up and grow. Greens were in good shape and held well. I agree - the greens at Rocky River couldn't be any slower. For me, it takes the enjoyment out of the round. Additionally, I think their tee boxes are in poor shape. It's a shame, b/c this course has such a great layout. 6/22 - Played at Olde Sycamore. This used to be my favorite until Carolina Lakes came around, but I still love it. It was in great shape, quick and fair greens, and a good test of golf. Sign up for their online discounts - some decent deals can be found. 11/12/07 - Played on 11/12. Course was in good shape, not spectacular, but not majors issues. A few of the greens had some spots under repair, including some newly sodded patches, but the pins were kept away from those spots. I actually thought the greens rolled pretty true with good speed. The tees and rough were just okay, but fine for winter shape. The fairways are starting to go dormant but they were fine for playing second shots. I do enjoy this course and it's a good round right now. I played Rocky River Wednesday, August 29 and found the greens in horrible shape. I was shocked! I have always loved the greens at Rocky River. They had large areas with no grass. Some greens had been somehow plowed with cuts running the length of the green. All greens had been punched. The holes were about 50% healed over. If you love Rocky River because of their consistant nice condition, don't play it now. You'll want a refund. 8/13/06 - Played on 8/11. One of the better conditioned courses I've played this summer. No complaints on any surface, tee to green. The rough is well-kept as well, even though the rain has it growing pretty fast. Contrary to some other local courses, you can generally find your ball without having to walk right on top of it, which was nice. After a so-so round, though, I was reminded how easy it is lose golf balls on this course, with a few forced carries with no bail-out areas for so-so shots. If I were a Concord resident (who get nice discounts on fees and memberships), I'd strongly consider making this my golf home. In great shape on 8-3-06. Tees as good as they've ever been. Fairways really lush (not dried out), and green. Didn't have a bad lie all day. Summer rules are a snap. A few of the greens had some burnt spots on them. However, the superintendent did a good job of placing the hole locations. Sure wish that they would change the flags to solid colors so they could be seen from far away. Those checkered flags without pin sheets are ridiculous. 4/21/06 - Played on 4/21. Course is green and in good shape. Greens especially were smooth and very nice. No problems with tees or bunkers. A few fairways were spotty, but most were nice. The best conditions I've played so far this year. 6/23/05 - Course in pretty good shape. Greens had some sand on them, but rolled fine and didn't affect play. A few tee boxes and greens had some spots under repair. Fairways were in great shape. Not sure if anyone else has played here recently, but I played Rocky River last weekend and the greens were the fastest I've ever played. I couldn't get my speed right and was blowing putts way by the hole. However, if you can get your speed right, there aren't greens that will roll more true, and you could have a great round.